I say every year that I hope to cover more electronic music... and yet somehow, in the last few months of the year, I find myself catching up with the acts that I really should have covered months ago - hence why it has taken so long to get to this review. And it's not like this album hasn't been on my schedule for some time. I may not have been talking much about music when Nicolas Jaar's critically adored debut album Space Is Only Noise dropped in 2011, but when I did start getting requests to cover him as early as 2015, where he reentered the spotlight courtesy of a few EPs and soundtrack albums. And when I went back to Space Is Only Noise, I actually really liked it. The slightly askew melodies, the vocal snippets against scant flutters of glitch, the intense intimacy of every bit of percussion, the haunted vocals, the odd sense of groove it had, it was a weird as hell record, but it had the sort of ridiculous poise and confidence that made Jaar seem like a veteran effortlessly crossing and blending styles. Again, like most electronica I cover, I will not say it's for everyone - too slow and diffuse to really dance to, not nearly as abrasive as more experimental producers tend to fly, not as melodic to build to consistent vibes, but not so spacious where it slips towards ambient music. This is music at the intersection of a lot of ideas, a fair few of them weird, and while they didn't all quite work for me on Space Is Only Noise - some of those melodic shifts and vocal samples were something else - I was definitely curious to check out Sirens, especially given how much critical acclaim was dumped on it. And thanks to consistent Patreon votes, it's now finally got its chance to shine - is it worth it? Well, if you all remember that review I made of the Common album Black America Again and how in context of the recent election it felt more and more like a distant echo? Yeah, Sirens by Nicolas Jaar falls into the exact same category, albeit with a bit more of an excuse given that it was released much earlier and isn't nearly as earnest and borderline-utopian as that record was. And yet if that had been the only issue I'd be willing to look past it... except that Sirens is also a much more sparse and bleak affair that isn't nearly as eclectic, groove-driven, or potent as Space Is Only Noise. Again, it's good, but it doesn't nearly coalesce with the same fascinating personality, and I can't help but feel it's not as great as it could have been. So first we need to talk about the music... and again, the stylistic blend is peculiar, although not entirely unfamiliar given Space Is Only Noise. There was always a slightly old-fashioned pop style - by that I mean from the 50s and 60s - existing in the swagger of Space Is Only Noise, but now it is far more pronounced, from the lyrical cadence of 'The Governor' and 'Three Sides of Nazareth' to the blatant doo-wop styling in the backing vocals and melodies of 'History Lesson', a rather on-the-nose showcase of instrumentation matching lyrical content. Of course, this does not mean these are conventional pop tracks - far from it, four of the six tracks go past the six minute mark, and it becomes clear that pop structure is used to compose the grooves that the wiry, sparking synths will evolve and devolve against over time. And sometimes they don't evolve at all - the long quiet of 'Killing Time' hits glassy breakpoints against cascades of piano before the melancholic melody establishes itself and the deeper clanking echo forms the beat, the ominous force that assumes more definition as the album continues through wailing, synthesized backing vocals. 'The Governor' might take a pop form in the vocal melody but the frenetic beats cribbed from footwork and the elongated sax-synth solo that drags through the midsection seeks to push that ominous atmosphere. 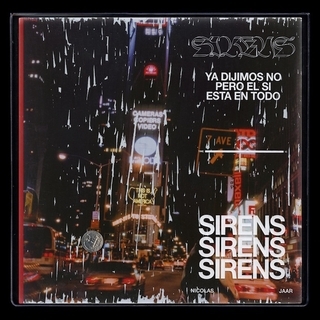 And despite the numerous examples of Spanish language samples across this record, it becomes most prominent on the Latin-inspired synth and groove of 'No', as the song structure decomposes and reforms around sandy textures, rattling strums, and shrill echoing tones across the mix, even glitch sparks around the percussion. My favourite case here is probably 'Three Sides Of Nazareth', if only because the melodic progression is the most intense as it rides against the oily waves of distortion and glitch, even though I wouldn't say it ever hits a direct climax... which, granted, is better than 'Leaves', barely an interlude with the Japanese-inspired plucked strings and the warbling synth effects that don't really evolve in a way that's all that interesting. Of course, this record isn't really aiming for a direct climax - more of a warning against incoming disaster, the message of which Nicolas Jaar takes directly to the microphone in abstract but pretty pointed lyrics. As a singer, I tend to like him in his lower, more reserved tones, so 'The Governor', 'No', and 'Three Sides Of Nazareth' work pretty well for me in comparison with the crooning of 'Killing Time' and especially 'History Lesson', but this is where we get into the content. As I already implied, Nicolas Jaar is taking an international perspective on the increased polarization of the United States and the rise of the current president-elect. And there are moments of hope on 'Killing Time' and 'No', the former showing how old paranoia can die off with time and the latter showing the strenuous effort taken in fighting against stagnant or corrupt systems especially when society is naturally committed to inertia, and Jaar seems aware he might very well fall in the same mold in twenty years. But the rest of this record are warnings: 'The Governor' digs into the ignorance at the top still being embraced by a desperate and addicted audience, cultivating the lingering despair in the youth that nothing will change, ignoring all of the alarms as some embrace a 'deicide monk' tendency, blending religious fervor to slay whatever is at the top, with the 'blind nun' representing the ones committed to the system unwilling to see the tyrant coming - after all, 'meaning is useless to the already sick'. And the political subtext becomes outright text on 'Three Sides Of Nazareth' and 'History Lesson', directly highlighting the moral contradictions in polarization, accusing one side of having no morals while relaxing theirs to attack, all while smart men do nothing. Nicolas Jaar is drawing a direct parallel with the rise and tyranny of Pinochet in Chile - the brutal borderline-fascist dictator who ruled through the 70s all the the way to the embrace of democracy in the 90s - and the current president-elect, described as a 'man who wore his pain like a list of all that he knew', a wild string of grudges with revenge in sight. Of course, despite how prescient and unsettling this warning is, it's undercut in a few important ways. Firstly, it's not like Jaar is making music that's going to reach a larger audience or convey the sort of dramatic urgency - probably not the best idea to begin with the complacency of 'Killing Time', or undercut tighter constructions with extended tracks that take the template of pop before spiraling into more experimental soundscapes. More importantly, it's an inexact parallel and that does hurt the message: Pinochet took power in a military coup that was reportedly backed by the US CIA, whereas a subset of the United States chose this path. And while of course Jaar was laying out the message that they actually had a choice to avert a nightmare and he couldn't have known what was to happen... but the reality is that too many didn't make that choice, and a tighter focus on the choice's importance might have made the themes linger more powerfully. As it is, though, the more I dug into the writing and subtext of Sirens the more I did like it - I just wish the actual song construction and glitch came together a little more strongly, or displayed the same level of eclectic personality that the last album had. The majority of it is here, but muted and darker, rendered even moreso by what happened on election night. And while Sirens weathers the aftermath better, it captures a moment and loses the tension of what might have been for the lingering despair of what is. As such, for me it's a light 7/10, but it's a tough album to recommend, not just because of the sound but the deeper context - it sure as hell isn't a cathartic listen, if you still need one. But if you're curious for some well-written, fascinatingly unique electronic music, Nicolas Jaar did deliver here, so again, if curious, definitely check this out.